The Internet is an absolute necessity when searching for college funding. Scholarship search services, such as FastWeb, are also valuable tools to be utilized. However, these services lack the variety and easy access that internet searching can provide. But how do you get the best information, latest scholarship and grant programs, and the most relevant search results targeted for your interests without wasting a lot of time? Google Search is considered by many to be the best choice among the top search engines and has one of the largest databases of web pages. Its search algorithms have rapidly evolved, assuring that all kinds of web data formats are crawled, indexed, and ranked according to their relevancy. So much more than a search engine; it’s become a megalopolis of cyber-scrapers; a full-bodied search service. At any one time Google has at least over a dozen Beta tools that all possess some targeted web and search-based capability. From its stable of beta tester utilities, frequent “graduates” earn their status as permanent Google utilities. Google News was once in a beta test form, but now serves up some of the freshest and most relevant news results for almost any keyword or key phrase you input, including scholarships. There is a caveat to all this free fraternization with Google’s on-going experiments: project engineers may disable, alter, or discard them, at any time. Are Alternative Search Engines Useful to You? UC-Berkeley, while it touts Google brawn, also supports the use of alternative search engines/services when research must be thorough. While Google may have the biggest database, information across all databases is somewhat proprietary, and sort and search algorithms vary. Cross-referencing a powerful competitor, such as Yahoo!, makes good sense and may expand the search horizon. During your search, you will encounter results in the natural and sponsored sections that offer scholarship related websites. Almost anyone with a website can buy sponsored listings and appear near the top results of your search. Although Google does serve the best natural (non-paid) results, many people still trust the top sponsored listings. According to a Consumer Reports WebWatch1 on June 9, 2005, more than 60 percent of web users were not aware that search engines list some websites more prominently than other websites by taking payment for higher placement. Always take notice of which results you click on. Ask yourself if the website you arrive at has other motives than helping you out. Be very careful when giving out your information. Some websites are created simply as lead generation venues which may sell your information to 3rd party companies or use your email to send spam. Scholarships are designed to help you pay for college. Stay away from services that require that you pay money to apply. When sparse and playful Google popped onto the web scene in 1998, it won quick legions of early Googlers and a basket of awards for its algorithmic agility and simple interface. Since then the heavily guarded algorithm has undergone many incarnations. Algorithm permutations have inspired such intrigue that their given names— Florida, Bourbon, and Jagger, among others—have a celebrity status among search engine gurus. This simplistic explanation of the algorithm illustrates why search keywords must be concise and targeted in order to return the best information. This set of search key phrases offers one more layer of depth beyond the basic keywords. If none of these are a fit for you, consider using a keyword tool to suggest a list of commonly used keywords and key phrases. The Google Keyword Tool delivers a reliable mash-up of hot and relevant key phrase variations based on the general keyword topics in which you’re interested. Keywords turned up in this tool will ramp up any scholarship and grant search. Search for keywords related to college scholarships and you will get a long list of closely to loosely related terms, some of which will likely provide even more granular and targeted scholarship results. Do the same with college scholarships site:.gov or college scholarships site:.edu for a selection of government and collegiate educational pages that contain keywords related to scholarships. Taken at face value, Google News looks like nothing more than a busy news aggregator, not unlike a page from CNN or MSNBC. Google News is, underneath it all, a powerful way to stay current on the latest college scholarship and college grant news. This is a flexible, robust, and fully searchable news database that is designed to work on a classic Google algorithm. Search Google’s news database by keywords, such as the basics outlined above to search the Web. Default search results appear in order of most recently relevant. You also have the option of choosing only the most recent results. Modify your Google News results with News Alerts. Save yourself a lot of search time and configure Alerts to deliver the latest news stories relevant to college scholarships and grants directly to your email inbox. You can choose from blog, web, news, groups, or comprehensive data results. From Google News results, search further dynamic data on scholarships and grants when you click on the “Blogs” link in the left hand navigation column. This takes you to Google Blog Search, but directly to those blog search results based on your initial search terms in Google News. Currency of information is an important factor in scholarship programs. Googlebot crawls websites with frequently updated data much more quickly than static web pages, so your scholarship news and blog data may be more current than normal web pages. Make sure you see the most current blog topics for your search terms: choose a time frame from the left-hand “Published” list. You can opt for information published within the “last hour,” or by day, week, and month. Or customize your own date range. Other Google search interfaces provide access to the same blog data, but it is often not immediately apparent or particularly intuitive. Later you’ll see how to quickly find the same up to the minute blog information from Google’s advanced search features. Not long ago, web users would have had to employ a toolbox of Boolean operators and search delimiters to simulate an advanced search of deep web-scape. Many such techniques remain beyond the savvy of most web users. While Booleans and some delimiters are still useful, Google, and other search engines, have developed powerful Advanced Search features that deliver the same results, plus some, as those painstakingly choreographed technical queries. Once you’ve done a thorough basic search for scholarships and grant money, use Google’s Advanced Search utility to discover more targeted data. The search utility may be accessed directly from the main Google search page—it’s in really fine hyperlinked text alongside the search field. Advanced Search provides an intuitive way to search with Boolean variables: input keywords and key phrases into one of the top four search fields that indicate how you would like the results filtered: exact phrase, none of the words, or with one or more words. Choose all file formats or filter those, too. For the most current information, make sure that in the Date field you choose “past 3 months,” or you could be delivered old information. Search by a specific domain name, or via “Page Specific” criteria. This advanced search feature is a powerful way to sort and filter more specific scholarship information once you’ve done a basic search. One advanced technique you can use right from the regular Google search page is using quotes around your search phrase. This makes sure that search results containing an exact match of your phrase are listed. If you wanted to search for New York scholarships, a certain group of results will display. Adding quotes and searching for “New York scholarships” will yield a completely different set of results. Always keep this technique in mind so you can tweak your search and get the results you really want to see. Another advanced technique to filter out certain results by adding a negative keyword to your search. For instance; you’re searching using a certain keyword phrase and keep seeing the same annoying spammy website in the results. Just add –spammydomain to the end of your search. It should then read “keyword phrase” –spammydomain. While a Google search will provide very relevant results, there are some flaws. As an individual searching for college money, you want to enter a search and quickly have access to the most reliable and informative websites. A search engine, by its nature, primarily uses automated algorithms to determine website quality. Ideally, humans would check each and every web page for quality, but this is entirely unfeasible with the enormous amounts of web pages in Google’s index. Many of the search results may be outdated, so make sure to verify if a scholarship is still available before adding it to your list of potential funding sources. However, there is a solution. Google’s Custom Search Engine utility allows us to use the power of Google’s search technology and create a custom search engine. We took advantage of this opportunity and a human-edited searchable database was created by focusing only on high quality scholarship and financial aid related websites. Web sites that were useful and informative were hand picked, and these are the sites that are being shown in the search results. It took a long time to compile the list in the database, but our Scholarship Search Engine will save students even more time. A list of “Topic-Specific Searches” links appears at the bottom of the Advanced Search page. The Universities search link may be useful for deep site searches. Have a selection of specific colleges or universities in which you’d be interested? 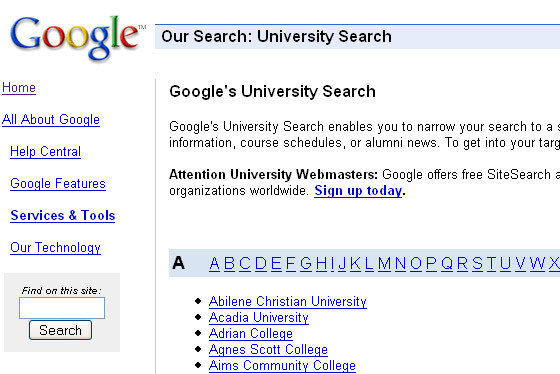 Use this search tool to target your keyword and key phrase search to a specific college or university’s website. Discover their interior scholarship and grant pages. For example, scroll down the list of colleges and universities and click on Boston University. Google University search takes you to a page that welcomes you to bu.edu. Type the search term, scholarships, into the search field and click the Search button. Google returns a large selection of BU’s deep web pages sorted in order of keyword relevance. Within the first three results you could find pertinent information on general BU scholarships, merit scholarships, and school-specific scholarships. Choose “timeline and map views,” that are most adaptable to location and time data. Choose to see a left-hand navigation column loaded with sets of related keywords and search topics relative to search term(s). Choose a right-hand navigation column with semantic terms relative to the search sphere. Increase your scholarship search productivity and choose the “Left-hand search navigation” feature. You’ll have to start by choosing one of Google’s sample search terms, which takes you into the feature. From here you can enter your own search terms. For example, when you enter college grants into the search field, the search results returned look pretty much like the same results you received when you conducted a basic web search. The left-hand navigation column, though, should look more like a shopping list of college grant-related terms and data sets. Search particular data formats for college grant information, such as blogs, images, news, and books. Whether you know it or not, this search view provides the same features found in a basic Google search for college grants; same search results, same search-related terms (just repositioned), and access to various formats of Google data, such as images, blogs, and news. What’s different? The way the information and search options are presented—collected into a visually sensible left hand search column—seems more intuitive, more accessible. As mentioned above, in the section on Google News and related blog information, you can access the same up to the minute blog posts and news items right here. And if it works better and saves time, then by all means use it. Once you begin mining all this scholarship and grant information, it’s hopeful that you will have a long list of possible free money sources to explore. How do you keep it all organized without wasting a lot of time and without going crazy? Google Notebook is a powerful online and browser-side scrapbook utility that intuitively allows you to post notes on the fly and organize by category on any subject you like, including college scholarships and grants. Create logical subsections of topics or information, such as community college scholarships, scholarships for women, or grants for physics majors. Chances are you would be eligible for a few types of scholarship and grant programs, so you could organize them in that way. Add a link in your notebook that points to the current web page you’re on. In the Notebook pane, open the comment field just below the title of the sub-section or topic relative to the page, and click “Clip.” An instant hyperlink to your current web page appears. Below it you can type in your own comment, or highlight particular text on the webpage and click “Clip” again to paste the clipping to your Notebook. To get started with Google Notebook you are required to create a user account; but it’s completely free. For net techies, a Google account also gains you access to developer tools if you’re so inclined. Google Web History is similar to a web browser’s history, except there are many more useful options. While scanning your history, you are able to flag (or ‘star’) certain web sites and even their interior pages that you have previously visited. There is also a convenient Tag feature to further categorize your history. On a side note, if you like to web surf quickly, you may forget to bookmark pages or put images and text into your Google Notebook. Luckily, you can always go back to your search history. Along with accessibility comes challenge. Google search services and companion utilities make it possible to access a huge array of scholarship and grant sources. Once you have mined the depths of online scholarship data, how do you separate current from outdated and how do you verify sources? Search engines—even Google’s—have their shortcomings. Databases ultimately perform based on algorithmic design, but still often miss small chunks of data. As mentioned at the beginning of this article, a quick search of another very powerful search service, such as Yahoo! will invariably turn up some unique scholarship and grant results that should be part of your search for free college funding. How to Filter .edu and Other Sites in Yahoo! You learned the trick in Google search that allows you to mostly filter .gov sites that are indexed for scholarship and college grant keywords. Yahoo! allows you similar dexterity when searching for scholarships directly from college and university sources. Go to the Yahoo Search page and click on the “Advanced Search” link at the right of the search bar. Want to go to college in Boston? Enter Boston scholarships in the top “all of these words” search bar. Below, select to search “only .edu domains”. 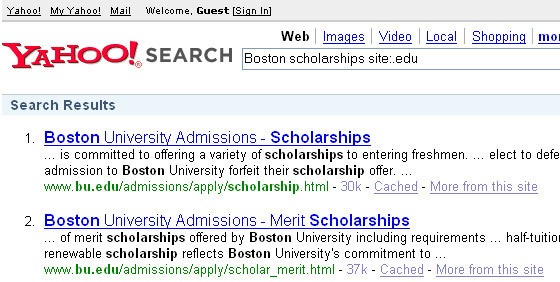 Search results will display that focus on Boston area college web pages that contain the keyword scholarships. Also note there is a helpful “only .gov domains” and “only .org domains” options. Sources may have little authority. Data may have little relevance. Search results that are irrelevant should be immediately apparent. Google algorithms are exceptional at filtering out data that does not match your request. At the very least, less relevant web pages are ranked poorly against those sorted into the first few pages. Using other search engines that specialize in college funding is also recommended. Sites such as FastWeb.com, Scholarships.com, and FindTuition.com all have databases of available funding sources. Along with their database, many other useful services are offered. To read about the top scholarship search services and what each has to offer, see our “Unbiased Look at the Leading Scholarship Search Services” article. A major source of scholarship and grant information can be found in recently published books. Amazon.com features utilities that can narrow your search for the right books. After searching for books related to your funding needs, you can sort the results to show the highest reviewed and most recently published books. Some books provide a 'Search Inside This Book' feature so you can browse inside the book and find out if it is relevant to information you want. This search box will be located under the 'Inside This Book' section on the Amazon page for a particular book. Many other books only allow the table of contents and a few select pages to be viewed. Look for the 'Search Inside This Book' feature to become more popular as more and more customers become aware of its value. 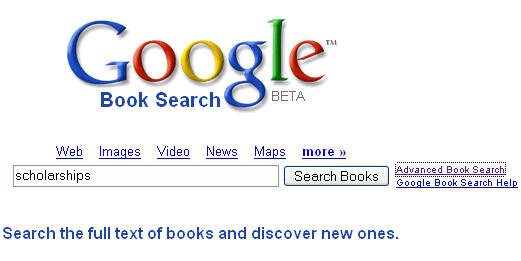 Google Book Search is a database of cataloged books. Some books are in their entirety, while others have only limited pages or snippets due to copyright law and the relationship of the publisher with Google's Partner Program. The accuracy and relevancy of your Google Book Search results may not be as targeted, comprehensive, or fresh as the other services we recommend. The reason being when you search, you are searching through ALL of their indexed books, not just books specifically on scholarships and grants which you can do as stated before with Amazon. The Advanced Book Search allows you to filter your search results in order to find the most recent and accessible books. 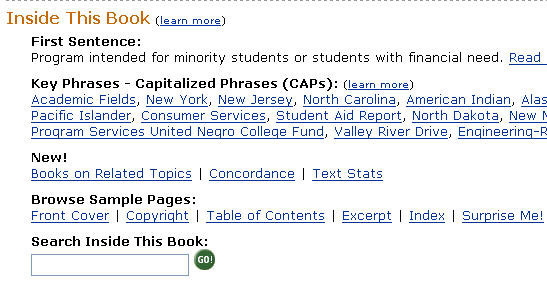 For example, you can access the full version of books related to minority scholarships that were published in the last 2 years. Although very useful, the Google Book Search service can be very time consuming, so you may want to consider using this once you've exhausted all other resources. The most authoritative sources are .gov and .edu sites. This is why we’ve shown you how you can filter your web search queries to target this information. Check for a recent page update, usually noted at the bottom of web pages. Cull scholarship information when applicable from dynamic sources, such as blogs and news clips. You’ve learned how to sort these, not only for precise relevance, but by publish date. Pick up the phone and call scholarship contacts. Don’t let this intimidate you. Scholarship contacts would rather you have the correct information. Free financial aid searches can be time consuming. You’ve learned how to apply Google’s brawn to your search. Start with a basic search, categorize the information in which you’re most interested, and follow this guide to make your Google scholarship and grant search increasingly agile and targeted. “How Google Works,” Google Guide, February 2007, http://www.googleguide.com/google_works.html.